One of the main morphological differences between men and women is the greater amount of fat that women carry. The morphological differences between women and men are the result of differences in the volume and proportion of similar anatomical features. With information on strengthening and toning the legs, buttocks, abs, and back, Women’s Strength Training Anatomy provides full-color, detailed anatomical illustrations of exercises for these hard-to-shape areas. What makes this book unique is that readers can see the muscles at work during each exercise, like an X ray of the body in motion. Are there definite anatomical differences in the way men and women should build their bodies? According to the best-selling author and illustrator of Strength Training Anatomy, the answer is an overwhelming yes! Exercise variations based on a woman’s unique anatomical features are also covered, helping to isolate muscles and make each exercise more effective. Make your workouts work harder for you! If you work out to strengthen and shape your body or if you help women get stronger and more defined, this is one book you need for understanding the female form and getting the most from your exercises. The former editor in chief of the French magazine PowerMag, FrÃ¯Â¿Å“dÃ¯Â¿Å“ric Delavier is currently a journalist for the French magazine Le Monde du Muscle and a contributor to several other muscle publications, including Men's Health Germany. 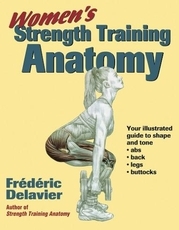 Author and illustrator of the best-selling Strength Training Anatomy, Delavier is a gifted artist with an exceptional knowledge of human anatomy. He studied morphology and anatomy for five years at the prestigious Ecole des Beaux-Arts in Paris and studied dissection for three years at the Paris FacultÃ¯Â¿Å“ de MÃ¯Â¿Å“dicine. Delavier won the French powerlifting title in 1988 and makes annual presentations on the sport applications of biomechanics at conferences in Switzerland. His teaching efforts have earned him the Grand Prix de Techniques et de PÃ¯Â¿Å“dagogie Sportive. Delavier lives in Paris, France.